3 days until my mom comes to visit for her birthday weekend! 23 days until I get to go back to Scotland! 28 days until the New Year...time to start thinking about those New Years Resolutions. Are you counting down to anything? Have fun Holiday plans coming up? Are you already making plans for 2013 like me? So, in the midst of this count down, over the course of December I will be counting up to four. A total of four donut recipes that is, as I am coining this month Donut December. First on the list, baked chocolate cake donuts with peppermint glaze and toasted coconut...look for it on Friday! Let's talk about these cookies though. They were a challenge that I accepted a couple of months ago, and have been thinking about how to recreate a cookie that I have only seen a picture of and heard a description of. 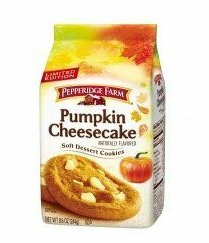 The cookies I was trying to mimic...Pepperidge Farm Pumpkin Cheesecake Cookies...see below. These cookies great. They were light, fluffy and cakey with a delicious pumpkin spice flavor. The cream cheese did exactly what I wanted it to, by not melting into the cookie, so that you get yummy cream cheese bits throughout. I will definitely be making these again! Enjoy! First things first, prep the cream cheese. Using two spoons, scoop cream cheese bits into 1/2 inch pieces and lightly dust with flour. This will keep the cream cheese from melting into the cookies as they bake. Laying it all out, maple syrup, the only sweetener in these cookies, baking soda, baking powder, salt, cinnamon, nutmeg and pumpkin. ...and then gently fold in the cream cheese pieces. Time for the oven. The cream cheese pieces totally look like marshmallows. 1. 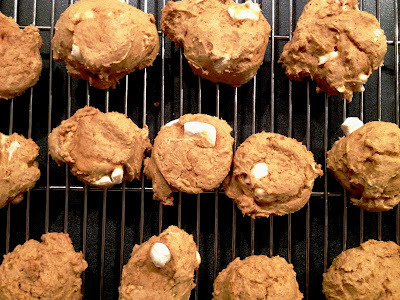 Preheat the oven to 350 degrees F. Using two spoons, scoop the cream cheese into large mini marshmallow sized chunks(about 1/2 inch), coat with flour and set in refrigerator. 2. In a small mixing bowl, combine the maple syrup, pumpkin puree and vanilla, whisking until smooth. In a large mixing bowl, using the back of a for cream the butter, then stir in about half the blended mixture. 3. In a separate bowl, whisk together the flour, baking soda, baking powder, salt, and spices. Add half of this to the creamed mixture, stirring just until blended. Stir in the rest of the pumpkin puree, followed by the remaining dry mix. Gently fold cream cheese piece (you want this to stay as pieces). 4. 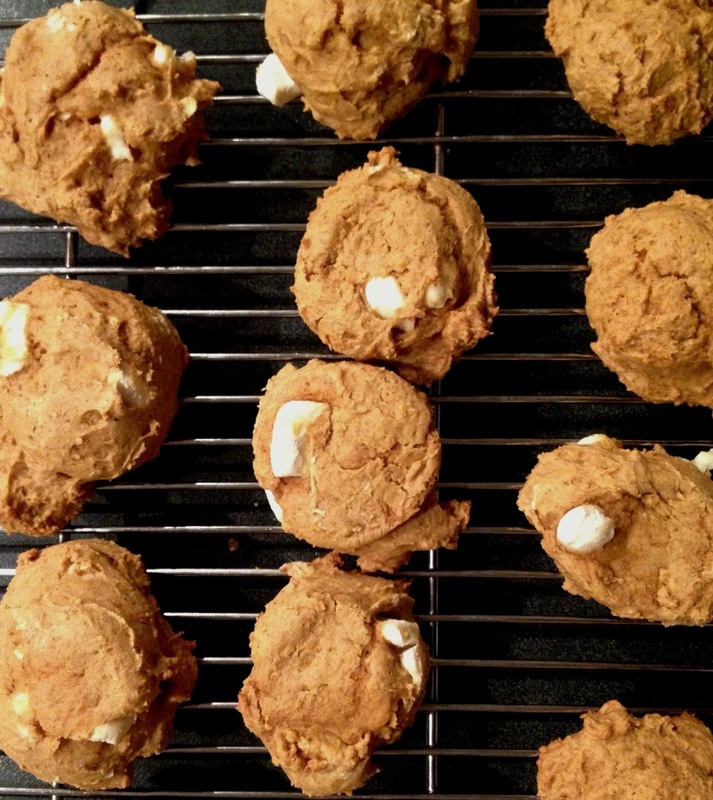 Using a cookie scoop or tablespoon, spoon heaping tablespoons of the batter onto a greased baking sheet, leaving a couple of inches between them for spreading. Gently press down just a little in the middle. Bake for 15 to 20 minutes, until the bottom edges just start to brown. Transfer to racks and cool. Enjoy!